In Joel and Ethan Coen’s “Barton Fink,” there’s a scene where the title character (John Turturro), a pretentious playwright who’s moved to Hollywood, meets his new neighbor Charlie (John Goodman), an insurance salesman. Fink shares his ambition to tell stories about “the common man,” with Charlie piping up that he could “tell you some stories” several times. Fink doesn’t take the hint, simply steamrolling ahead instead of listening to the guy whose voice he’s supposedly out to capture. It can be a frustratingly similar experience for a member of a marginalized group trying to get a word in edgewise with someone claiming to advocate for you, especially if they’re being less helpful than they imagine they are. It can be mortifying to be told you’re hindering rather than helping, but someone who sincerely cares about their advocacy will make time to listen to those affected by it. And then there’s William Shatner, best known for his role on Boston Legal. I’m kidding, of course. I know he also does ads for Priceline. On the April 2, World Autism Awareness Day, Shatner tweeted a meme promoting Autism Speaks’ Light it Up Blue campaign. Like a racist uncle at Thanksgiving, this campaign and group, despite their ignorance and hatefulness, are embraced by numerous well-meaning people. I’ve written at length about the hate for autistic people inherent in Autism Speaks and their campaign, but here are the highlights: The organization and campaign both feature dehumanizing “cure” rhetoric that center not autistic people, but their parents. Autistic people are presented as burdensome and even malevolent. The Light it Up Blue campaign also uses blue to gender autism even as research shows this misconception leads to underdiagnosis in women and girls. Which brings us back to William Shatner, who was very politely informed of these facts by some of his Twitter followers. 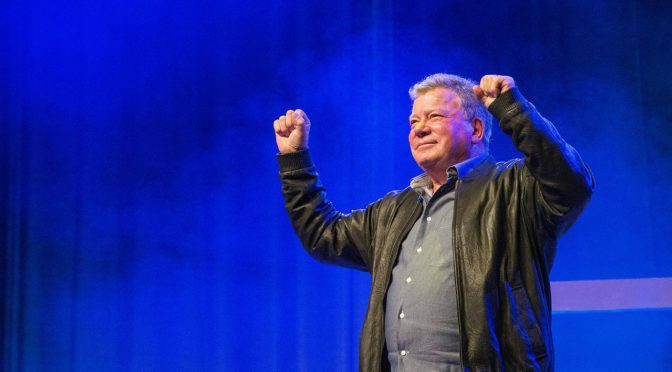 Shatner took all of five minutes to reject journalist Emily Willingham out of hand, telling her the Forbes article she tweeted at him “negated any good point” with a reference to Autism Speaks founder Bob Wright’s friendship with Donald Trump, himself no stranger to eliminationist rhetoric about autistic people. When another user chided him for dismissing the people he claimed to support, Shatner scolded her for using profanity. When Autistic Self Advocacy Network founder Ari Ne’eman, one of President Obama’s appointees to the National Council on Disability, took Shatner to task for berating autistic people for trying to educate him, Shatner blocked him, and continued to defend himself by accusing Ne’eman of harassment and bullying. But for me, the value of Star Trek as an autistic person goes deeper than that. It’s not simply that I can empathize with and relate to Spock, it’s that he exists in an environment where everyone around him accepts his alternate perspective and never treats it as burdensome or a deviation from the “correct” one. Genre fiction has always been particularly ripe for this sort of representation due to the freedom to world-build it enjoys, and that sort of coding has given me and other autistic people numerous icons to look up to within those genres, from Spock to Buffy the Vampire Slayer’s Anya to Hannibal’s Will Graham. Indeed, throughout the original Star Trek series and its successors, the notion that unfamiliar cultures, people and places become easier to understand simply through making the effort to honestly communicate with them. When Shatner won’t listen to people who inarguably know what they’re talking about, he loses sight of that. And that’s a shame, to say the least. Shatner, of course, is a flawed human being, one who exists independent of the fictional universe James T. Kirk inhabited. But a man who helped bring that optimistic vision to life owes it, to some extent, to his fans to use his platform to promote similar values. Like anyone who claims to support us, it’s on him to listen to our perspective on how best to do that, as it is with our neurotypical friends and family as well. I’ve been lucky enough to have parents and a wife who do exactly that, but lots of autistic people don’t have that privilege, and in those cases, taking the time to listen to what helps and hurts is more important than ever. Growing up, my hero was my dad. While I had others he was always head and shoulders above them. As I became a young adult I began to see him as he truly is, a flawed human just like the rest of us. It took me a long time to understand that, but it was one of the best life lessons I learned. I see him as a flawed NT human, while I am a flawed autistic human. Now he truly is a hero, and the rest, well they pale in comparison. Meeting my hero…. I try to meet him as often as I can. I would argue that Shatner never understood Rodenberry’s vision to begin with, or at least not as in depth as Nimoy and Stewart did.